Kelly-Hill Company recently performed inspection and maintenance services for Golden Triangle Energy after a partial derail incident. 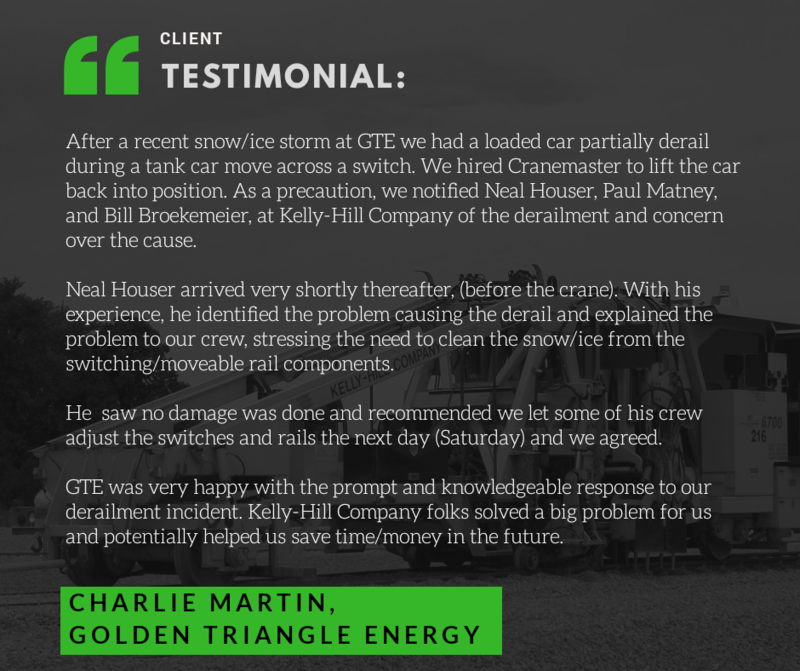 Charlie Martin of Golden Triangle Energy was kind enough to provide client testimonial of our services. “After a recent snow/ice storm at GTE we had a loaded car partially derail during a tank car move across a switch. We hired Cranemaster to lift the car back into position. As a precaution, we notified Neal Houser, Paul Matney and Bill Broekemeier, at Kelly-Hill Company of the derailment and concern over the cause. Neal Houser arrived very shortly thereafter, (before the crane). With his experience he identified the problem causing the derail and explained the problem to our crew, stressing the need to clean the snow/ice from the switching/moveable rail components. He saw that no damage was done and recommended we let some of his crew adjust the switches and rails the next day (Saturday) and we agreed. The two man crew showed up Saturday and adjusted all of our switches and reported them ready to go after the work was completed. GTE was very happy with the prompt and knowledgeable response to our derailment incident.